En la competición organizada por la revista japones “Wine-What! ?, hemos recibido una medalla de oro por nuestros vino Finca Enguera Cuvee Taka 2012. Este vino nace de nuestra uva monastrell, con una vinificación muy suave, respetando el perfil aromático propio de la variedad cultivada en nuestro valle. Inspirado en el templo de Kamakura, refleja la paz y armonía de dos mundos unidos por la amistad de Tetsuo Takahashi y Bodegas Enguera. 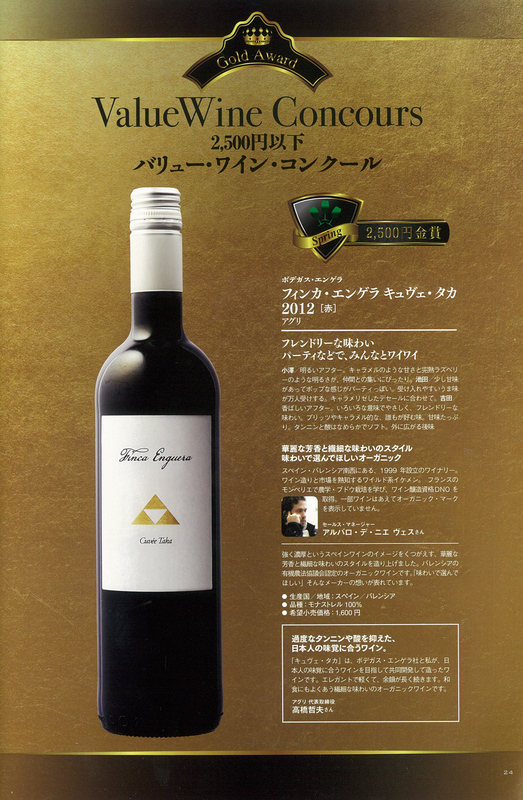 We have been awarded with a golden medal in the Japanese competition, organised by wine magazine “Wine-What!?”. Our wine Finca Enguera Cuvee Taka 2012 comes from the Monastrell grape, with a very soft and respectful process, obtaining the genuine aromatic profile of this variety in our valley. It is inspired in the Kamakura Temple, reflecting peace and harmony of two worlds united by a long friendship between Tetsuo Takahashi and Bodegas Enguera. This entry was posted on 9 septiembre 2015 at 9:28 am and is filed under Uncategorized. You can follow any responses to this entry through the RSS 2.0 feed. Responses are currently closed, but you can trackback from your own site.